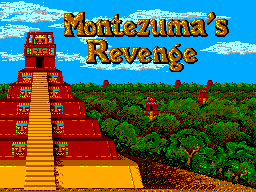 Montezuma's Revenge - Featuring Panama Joe - Games - SMS Power! PANAMA JOE™ is a cunning daredevil—tough, clever, and fast on his feet. If the reward's large enough, he'll risk everything. Winning, that's all that counts! 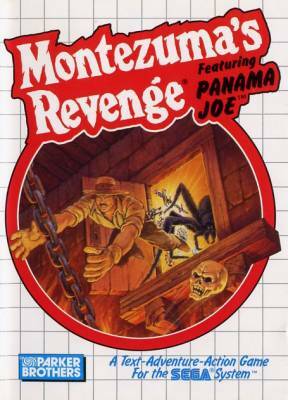 Once you start this game, you are PANAMA JOE. 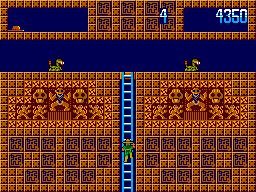 In 11 graduated levels of gameplay, you race against perils and time through the 100-room mazes of Emperor Montezuma's death-dealing pyramids. Your goal: to collect a fortune in hidden Aztec loot, rack up points—and stay alive! This state-of-the-art video game provides heart-pounding action and adventure, as you climb ladders, slide down poles, and grab special tools to escape the dangers that await you. Beware of the deadly spiders, rolling skulls, and floors that mysteriously vanish, dropping you into a fiery pit. 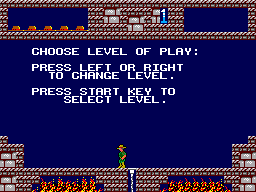 React in a flash, or you'll lose one of PANAMA JOE'S six lives. Lose 'em all, and you lose the game! No sweat, right? Because you thrive on danger and adventure, and you're ready for anything. Just be sure to keep a cool head—and don't be blinded by greed when you discover Montezuma's fabulous treasures! So grab a torch and enter the first pyramid. 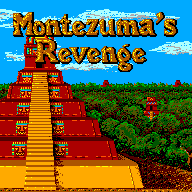 But keep your eyes and ears open... or you could be the next victim of MONTEZUMA'S REVENGE!